September 4, 2018  With a slippery face and a thousand voices, the Swedish artist uses her music in Fever Ray and The Knife to pull into frame what society would prefer stay hidden. 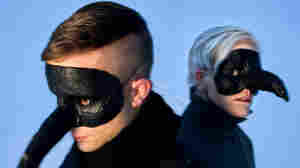 September 6, 2017  In 2017, to compare a new alt-pop act to The Knife is stating the obvious by default: The duo's 2006 album remade indie and pop in its deliberate, unsettling image. August 14, 2017  Everyone sang, everyone danced, everyone banged on outlandishly decorated instruments built especially for the tour — but nobody knew who the performers were. August 10, 2017  What, may we ask while hyperventilating, the heck are these videos that just showed up on The Knife's Facebook page? January 1, 2014  In a rare audio interview, the Swedish electronic duo reveals how its latest album, Shaking The Habitual, is an extension of the philosophy that "everything is politicized." 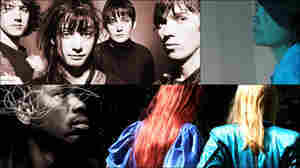 February 5, 2013  Our latest weekly mix includes songs from some of the year's most anticipated new albums, including the long-awaited My Bloody Valentine record, and an epic electronic jam from The Knife. 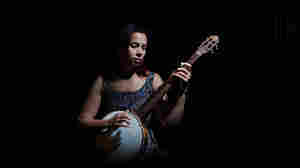 We've also got new music from Four Tet, Cloud Cult, Malian kora player Ballake Sissoko and more! March 29, 2007  A Swedish duo who employ synthesizers and a dark, even macabre point of view may not be to every listeners' taste. 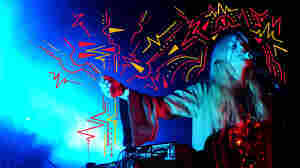 But The Knife, whose CD Silent Shout was a favorite among music bloggers and Web sites like Pitchfork, may be an exception. Among the darkness, there is a lighter side. 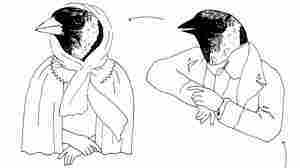 August 11, 2010  The 11-minute "Colouring of Pigeons" takes The Knife's experimental, cerebral side to new heights. February 1, 2010  The Magnetic Fields return with a new album, The Preservation Hall Jazz Band, The Knife, Brooklyn Rider, Giant Drag and The Heligoats on this All Songs Considered. January 28, 2010  Something beautiful happens in the midst of The Knife's electro-opera, based on Charles Darwin's The Origin of Species: The music itself evolves as the album progresses. December 13, 2007  It's time to gather 'round the warm glow of your computer and get cozy with some holiday fare from All Songs Considered. March 2, 2007  A strong return from Rickie Lee Jones; David Bowie meets The Last Town Chorus; Haunting Nashville singer Cortney Tidwell; Swedish electronica duo The Knife and more.